The most common ankle injury is a sprain. A sprain occurs when a ligament, the tissue that joins bone to bone and helps stabilize a joint, is torn. Most commonly in an ankle sprain it is the lateral ligament complex which is involved and usually it is the anterior talofibular ligament that is injured. 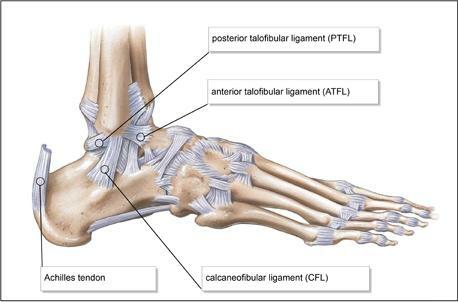 Which ligament is injured depends on the position of the foot at the time of injury. Given most ankle sprains occur with the foot slightly plantarflexed (pointed), for example your foot slipping off a step, landing on another players foot or standing on an uneven surface, it is the anterior talofibular ligament which is most at risk. Sprains are usually graded I-III depending on their severity. You may also notice pain on the medial (inside) aspect of your ankle following a sprain. This is often due to the fact that these structures are compressed/bruised during the initial injury. You may notice bruising that extends down to your toes and around to the back of your heel. This doesn’t mean that this area has been injured but may simply be where the blood has tracked to following the injury. The best course of immediate action is to follow the RICER protocol. Rest, Ice, Compression, Elevation, and Referral. This should be followed for the first 48-72 hrs to help reduce the amount of bleeding and damage to the tissue and allow for optimal healing. Refer to a doctor or physiotherapist for proper evaluation and then rehabilitation. Also adhere to the no HARM protocol. No Heat, no Alcohol, no Running (minimize activity), no Massage. Most simple ankle sprains will heal within 2-6 weeks but more severe sprains may take up to 12 weeks. This does not always mean you will have regained full function or be ready to return to sport within this time period. To minimize the risk of reinjury you should follow a full rehabilitation program that ensures you regain full strength, range of motion, proprioception/balance and includes sport specific drills.